Landing Pages by TabSite are a powerful feature allowing you to create lead capture pages using any app. Each Landing Page allows you to setup Facebook Ad tracking pixels to run ads and see ROI on traffic and submissions, and you can see stats on each landing page in the Analytics area. 1. In the TabSite manager, go to "Add App" and select the App of choice. This opens the manager setup for that app. 3. 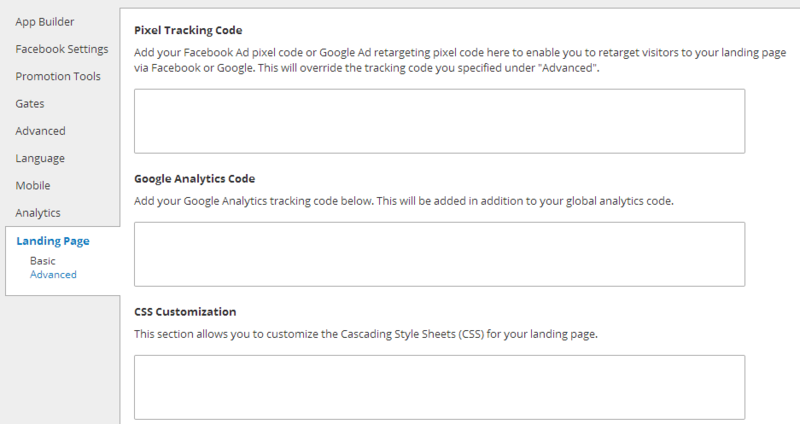 Next, if desired, put the Pixel Tracking code for Facebook and or Google Ads for your landing page tracking. You can also modify and customize your Landing page further in this area if you know how to do CSS styling. Once complete, your landing page functions and publishes by using the "Publish" feature on the app.